Nov. 21, 2012. Appalachian State University dominated the all-Southern Conference teams announced by the league office on Tuesday, with Appalachian represented 12 times on the coaches’ all-conference teams and placing 10 players on the media’s all-SoCon squads, both league highs. Headlining the Mountaineers’ all-conference honorees are wide receiver Sean Price (Reston, Va./South Lakes), who was named the SoCon’s Freshman of the Year by the league’s coaches and media, and senior linebacker Jeremy Kimbrough (Decatur, Ga./Cedar Grove), who is the coaches’ co-Defensive Player of the Year. Price is Appalachian State’s first SoCon Freshman of the Year since Armanti Edwards in 2006 and only the sixth Mountaineer to ever win the award. Despite playing in just nine games, Price leads all freshmen nationally with 68 receptions, 1,029 receiving yards and eight touchdown catches, all Appalachian State freshman records. He needs just four receptions and 45 receiving yards to break the NCAA Division I FCS freshman records in both categories, the latter of which was set by Marshall’s Randy Moss in 1996. Regardless of class, Price ranks seventh nationally in receiving yardage (114.3 per game) and eighth in receptions (7.6 per game). The 6-5, 210-pound wideout is also a leading candidate for the 2012 Jerry Rice Award, which honors the nation’s top FCS freshman. Kimbrough is the sixth Mountaineer in the last 11 seasons to be recognized by the SoCon’s coaches as the league’s Defensive Player of the Year. A top candidate for the 2012 Buck Buchanan Award, which is presented to the nation’s best FCS defensive player. The 5-10, 240-pound middle linebacker ranks sixth nationally with 128 tackles on the season (11.6 per game) and is among the SoCon’s top 15 in both tackles for loss (9.0) and sacks (3.5). He is tied for 19th among all active FCS players with 297 career tackles. In addition to Price, quarterback Jamal Jackson (Atlanta, Ga./North Atlanta) also received first-team all-conference recognition from the SoCon’s coaches and media on offense while cornerback Demetrius McCray(Covington, Ga./Newton) joined Kimbrough as a first-team defensive honoree the coaches and media. Punter Sam Martin (Fayetteville, Ga./Starr’s Mill) rounded out the five Mountaineers named first-team all-conference by both the coaches and media. 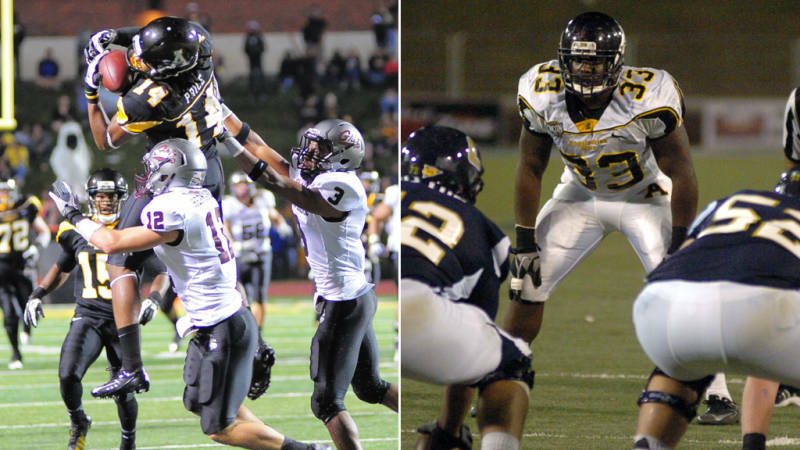 Running back Steven Miller (Piscataway, N.J./Piscataway), defensive lineman Ronald Blair (Greensboro, Ga./Greene County) and safety Troy Sanders (Chester, S.C./Chester) earned first-team accolades from the media and second-team recognition from the coaches while wide receiver Andrew Peacock (Durham, N.C./Northern Durham) and linebacker Brandon Grier (Charlotte, N.C./West Charlotte) were unanimous second-team selections. Rounding out the Mountaineers’ 12 all-conference honorees, Tony Washington (High Point, N.C./T.W. Andrews) was voted by second-team return specialist by the coaches and Martin collected second-team honors as a place-kicker from the coaches to go along with his unanimous first-team recognition as a punter. Additionally, five Mountaineers earned a spot on the coaches 25-member all-freshman team — Price, offensive lineman Shaq Counts (Irmo, S.C./Irmo), wide receiver Malachi Jones (Roswell, Ga./Central Gwinnett), defensive lineman Stephen Burns (Taylorsville, N.C./Alexander Central) and defensive lineman Davante Harris (Blythewood, S.C./Blythewood). Appalachian State won its seventh Southern Conference championship in eight years in 2012, finishing the regular season at 8-3 overall and 6-2 in conference play. The seventh-ranked Mountaineers earned their eighth-consecutive NCAA Division I Football Championship berth and open the postseason on Saturday, Dec. 1 when they host No. 16 Illinois State in a second-round matchup at Kidd Brewer Stadium in Boone, N.C. Kickoff is set for 2 p.m.